There was a time, not too long ago, that filming jibs could only be afforded by production houses and studios. The semi-pro shooter or consumer hobbyist was left in the financial dust dreaming of getting those incredible aerial pans and tilts so beautifully demonstrated in the opening scenes of 'Forest Gump' and a plethora of other films. The jib is a boom device with a camera on one end and a measured counterweight on the other creating a balance between the two much like two children on a see-saw. 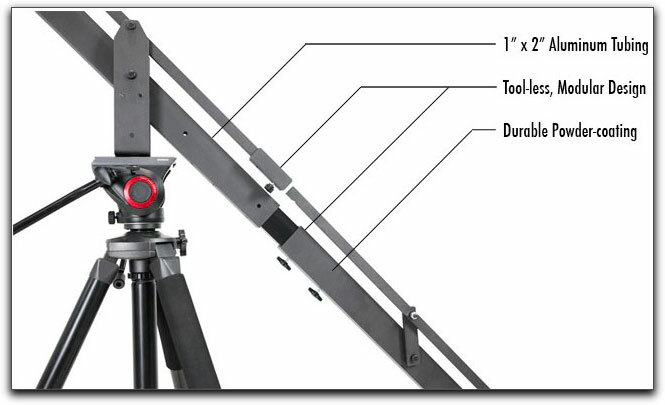 With a jib, however, the balance point is much closer to the counterweight so that the camera can be extended a significant distance and move vertically and horizontally through an extended arc. Being able to move both vertically and horizontally at the same time enables you to shoot many more creative shots than can be taken when you are limited to a fixed camera on a standard tripod. 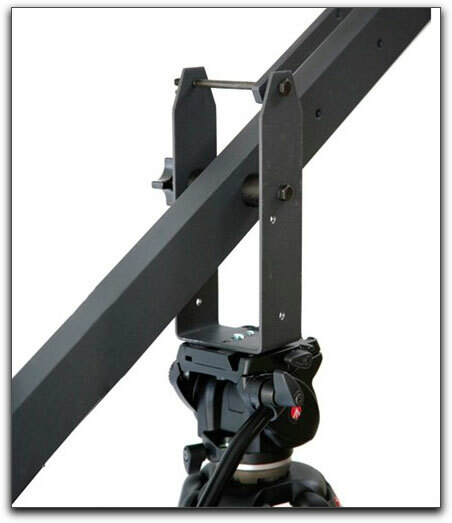 Finally, a good quality crane, coupled with a relatively inexpensive cost, has been made available to anyone whose film work will be enhanced by having and utilizing such a beneficial filming tool. ProAm USA has come out with 3 models of cranes. 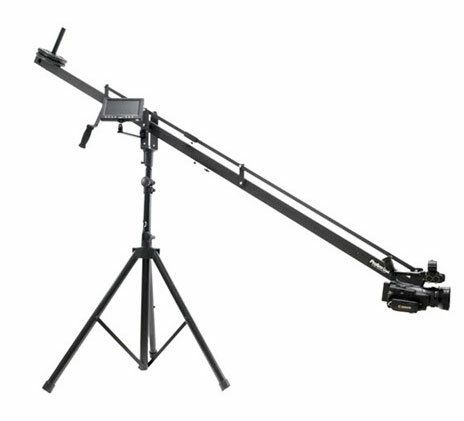 The one I tested was their middle priced jib, the Orion DVC210. It is an 8' crane but one that can support an optional extension providing a height closer to 12' enabling for some outstanding aerial shots. The crane is made from 1" x 2" aluminum tubing, nicely powder coated for a more secure grip in your hands. The aluminum tubing is considerably less costly than carbon fiber which greatly helps to keep costs down. I am not known for being especially handy around the house and I have often said that if I can attach the chain to the toilet bowl float that is as far as I get to patting myself on the back. When the jib arrived at my home I was, at first, intimidated by the numerous parts that needed to be put together. However, I found that the small photo illustrated assembly booklet that came with the Orion made for a fairly quick and easy completion of the task. The Orion jib comes in a long, optional carry bag which contained an extra outside pocket that would prove handy for storing extra or spare parts. The optional storage bag is both convenient and necessary for travel purposes. Inside the bag was another bag containing the important tripod that would serve as a base for the jib. The tripod's legs have rubber feet that were easily removed to reveal spikes providing an alternative form of stability. The tripod itself has lockable mid leg spreaders providing greater stability to the entire unit. Once the tripod has been set up you only need to remove the release plate from the tripod head and screw in the crane's own mount ensuring, at this stage, that the tripod's tilt function is tightened down. At that point, it was a simple procedure to set the jib's main shaft and extension plate, which when also tightened down, allows you to then connect the rear section of the jib as well as any optional front extension. Shown, the bracket holding the jib's extension. The extension slid nicely into the connecting bar which displayed the preciseness in the manufacturing of the ProAm crane. There are a few different camera mounting brackets provided depending upon the camcorder or camera you are using. Any extra pieces fit nicely into the crane's carry bag to prevent lossage. The rear of the crane has two options for creating a counter balance. Small weights must be used on the horizontal bar in the rear of the crane or on rear vertical bar to serve as a counterbalance for the camera. These counterweights are an important part of the system as they provide stability to the crane for both vertical tilts as well as horizontal panning. 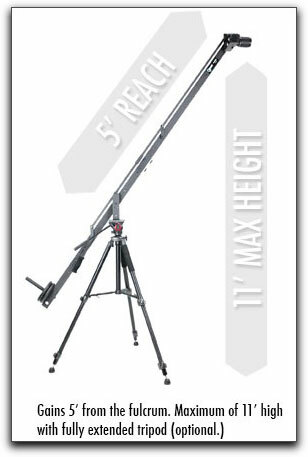 While the crane is rated for a 10 lb max camera load, a ratio of 4:1 is recommended for a 5 lb load. This equates to about 20 lbs. If you are not experienced using a crane, it is highly recommended that you practice with it shooting many of the type of shots that you might need or want for a shoot when it counts. 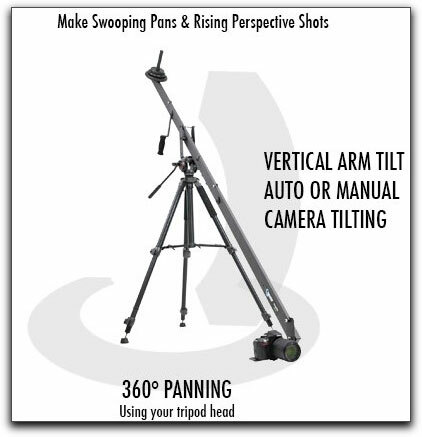 I had not used one for some time and when tilting and panning at the same time using the jib's tilt lever, didn't notice my assistant, Brad, who had come up behind me. Knocked him in the head, I did, but he was fine. As I have often made observational comments regarding a manufacture's website, there are no tutorial videos on how to properly use the Orion crane or suggestions on how to achieve many of the excellent effects one can achieve by using it. The assumption that the buyer will automatically know is not a good one. Sure, the customer, with a goodly amount of practice will eventually figure things out by trial and error, but it would be so much better if there was a tutorial for the consumer. Oh, how I would have loved to have had this jib when I was filming the animal migration in Kenya a few years ago. I just think of the shots I could have gotten as opposed to leaning half way out of my jeep hand holding the cam or using a sandbag on the window's edge. 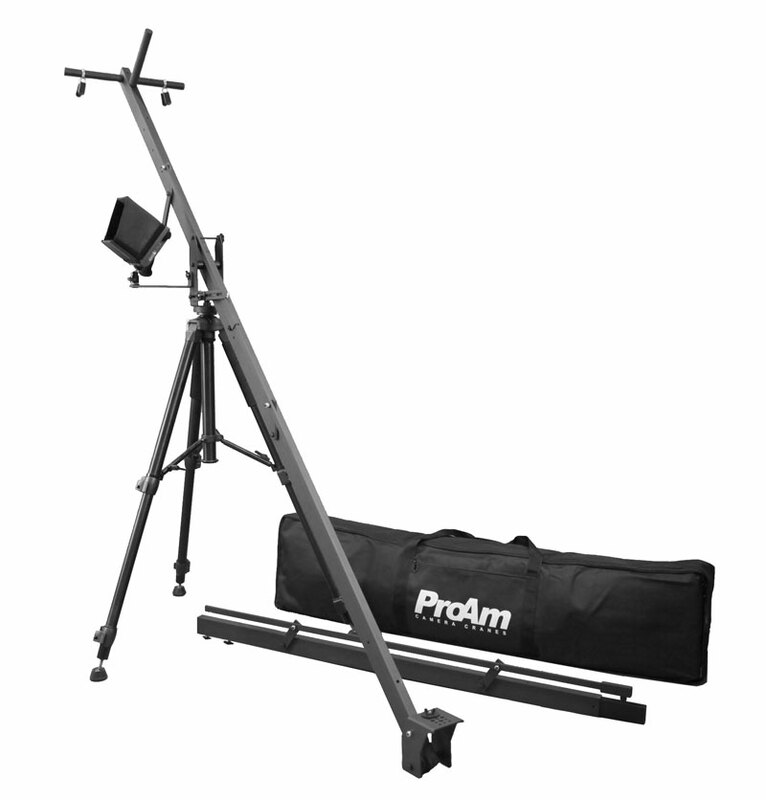 If scenes limited to whatever you could shoot via your stationary tripod have held you back from shooting the type of shots that you had hoped for, then the ProAm USA Orion DVC210 is now within reach at a more than reasonable price. Steve Douglas is a certified Apple Pro for Final Cut Pro 7 and underwater videographer. A winner of the 1999 Pacific Coast Underwater Film Competition, 2003 IVIE competition, 2004 Los Angeles Underwater Photographic competition, and the prestigious 2005 International Beneath the Sea Film Competition, where he also won the Stan Waterman Award for Excellence in Underwater Videography and 'Diver of the Year', Steve was a safety diver on the feature film "The Deep Blue Sea", contributed footage to the Seaworld Park's Atlantis Production, and Productions for National Geographic and the History channels. 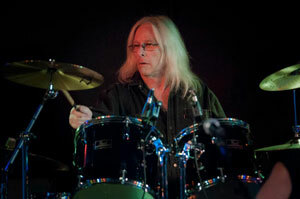 Steve was a feature writer for Asian Diver Magazine and is one of the founding organizers of the San Diego UnderSea Film Exhibition.